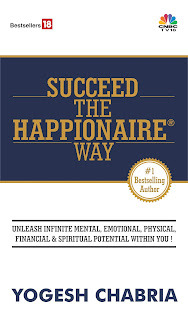 Yogesh Chabria - The Happionaire ​Blog - Best Motivational Speakers In India - Inspiration, Success: What Does Every Indian Want? What Does Every Indian Want? What do you want as an Indian? I am sure if you were to pause and think, what you want is what almost every other Indian wants. Irrespective who I speak to, they want a better life, they wants economic growth, they want safety, they want peace, they want love and happiness. They want friendship and a positive atmosphere where they can laugh, learn and make the most of this wonderful life. They want people to work and live together and embrace each others ways of thoughts and religions. Nobody wants extremists in colleges, neither do they want lawyers attacking people on whom the courts can take a decision. Our country has a rich history, culture and has been the world's strongest economic, cultural and scientific and spiritual power - it is time we regain that power. There are extreme forces that want to divide the people and unity of a nation, not only a nation, but the entire humanity. We need to unite and become stronger, we need to realize that India is one of the greatest places in the world, where people have the freedom to do what they want. Where we have a rich tradition of respecting all and at the same time being proud of our own beliefs, ways and thoughts. Right from Yoga, Meditation, Spirituality to Advanced Science and even concepts of time travel and parallel universes have been known to our civilization and we need to re-discover these and share it with the world to make humanity richer. Indians want to grow and move ahead in unity with all our diverse cultures, religion and ways of thought. We have been a country which has people of all religions and communities and are truly secular. I am a Hindu and proud of being a Hindu, and in addition to this I am proud that we have incredible entertainers who are Muslims, great writers who are Christians, great business people who are Zoroastrians, great soldiers who are Sikh and many more. For me, like all most all Indians what is important is the person and the skills the person possesses irrespective of their religion. Since thousands of years, India has welcomed people of all faiths and views to practice their religion while ensuring they do not force their views on anyone and live in peace and harmony with all. Today what the media, the reporters, people in social media and twitter need to realize is that now is the time when we need to unite together even more as Indians, as human being and humanity and together ensure there is economic growth, spiritual growth, human growth of the mind, soul and body. We need to invest in the upliftment and development of man and mankind as this is what will take civilization ahead. After the tremendous success of events like Make In India which has attracted potential investments of over $200 Billion we need to work on building a culture of love, peace and universal happiness. We as the people of this great nation have a great future and immense potential, we need to channelize it in the right direction. I want each one of you, if you believe and agree with this thought, to simply share it with everyone you know. With every journalist, with every reporter, with every politician and with every Indian to make sure we focus on what is important and not on things that divide us. Let us stop shouting and start listening. Lots of love, smiles and happiness to all! Excellent article - need to share it with every Indian. India is the only country where people of all religions are so free to practice, even in Europe we do not have this freedom. I am a Muslim and married to a Hindu and proud to be born in India.